Uploading additional financial instution account information to the Budget Tool. 1. Please click on the Options link, and that will cause for a drop-down menu to appear. Please select Upload Accounts from another Institution link, this will take you to the next page. 2. Once the next page has opened, you will see the above screen. Please click on 'Browse...' this will bring up the pop-up window we see above on the right. This window is browsing your computer. 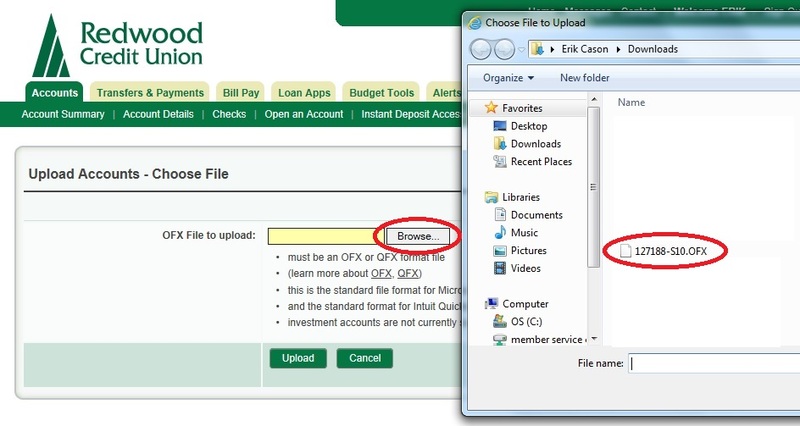 Please find where you have downloaded your .QFX or .OFX from your other financial institution. Once you have located that, please choose that file to upload and then click on Upload. Note: Please be aware that the upload process can take up to five minutes depending on the size of the file.